To measure the frequency and content of online social networking among medical students and residents. Using the online network Facebook, we evaluated online profiles of all medical students (n = 501) and residents (n = 312) at the University of Florida, Gainesville. Objective measures included the existence of a profile, whether it was made private, and any personally identifiable information. Subjective outcomes included photographic content, affiliated social groups, and personal information not generally disclosed in a doctor–patient encounter. Social networking with Facebook is common among medical trainees, with 44.5% having an account. Medical students used it frequently (64.3%) and residents less frequently (12.8%, p < .0001). The majority of accounts (83.3%) listed at least 1 form of personally identifiable information, only a third (37.5%) were made private, and some accounts displayed potentially unprofessional material. 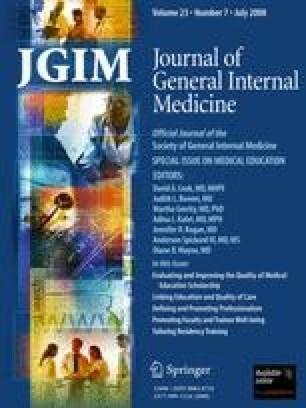 There was a significant decline in utilization of Facebook as trainees approached medical or residency graduation (first year as referent, years 3 and 4, p < .05). While social networking in medical trainees is common in the current culture of emerging professionals, a majority of users allow anyone to view their profile. With a significant proportion having subjectively inappropriate content, ACGME competencies in professionalism must include instruction on the intersection of personal and professional identities. We would like to thank the Office of Privacy at the University of Florida, specifically Susan Blair, for their careful review of this manuscript. The authors received no external funding for this project. Dr. Thompson received internal support from the Department of Pediatrics to participate in this study. This project did not receive any grant support. ACGME Outcomes Project. Common Program requirements. Outcomes Project Available at: http://www.acgme.org/Outcome/. Accessed January 14, 2008. Facebook. Available at: http://www.facebook.com/. Accessed January 14, 2008.